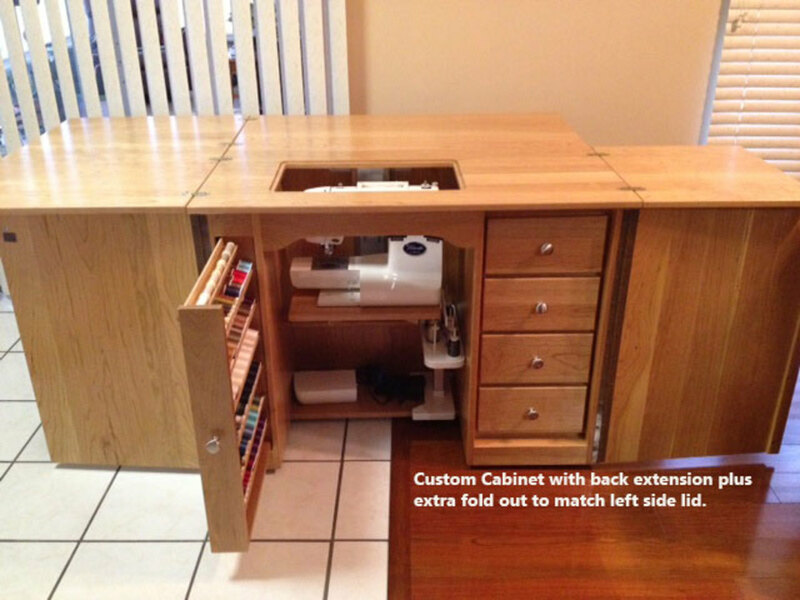 Planning on buying a new sewing machine cabinet? By understanding your sewing cabinet choices, you just might be able to go custom hardwood and end up with a cherished family heirloom. Surprisingly Amish solid wood cabinets are available for what you might otherwise end up shelling out for a particle board sewing machine cabinet. 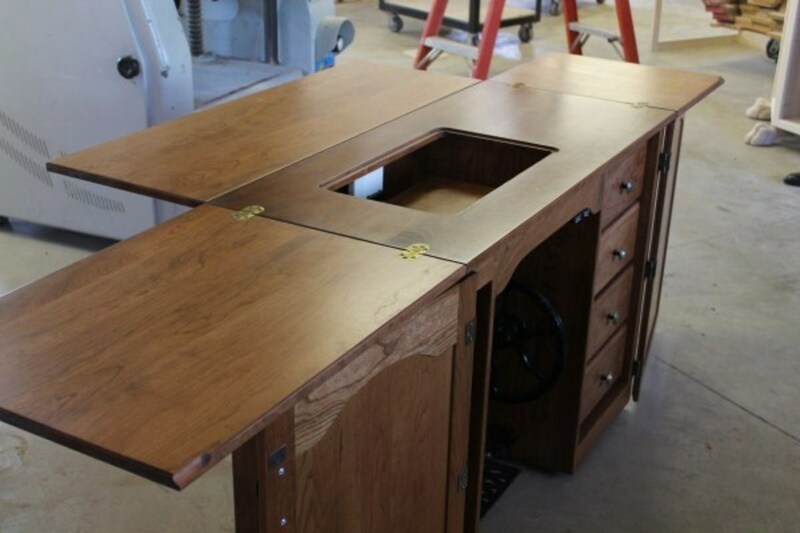 People are finding Amish custom built sewing cabinets in the very same price range or even cheaper than those particle board and pressed wood cabinets being sold at most sewing machine centers. In fact we found one of the more popular particle board cabinets in a sewing machine shop that was shown as marked down to $1700, from the original price of $2298. 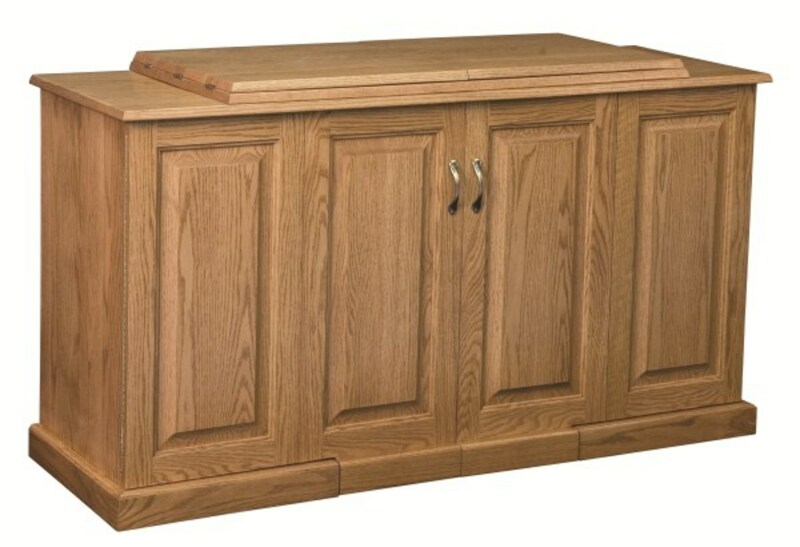 In contrast Cottage Craft Works .com offers beautiful Amish oak sewing cabinets from $1095 to $1850 for the most deluxe with a serger compartment. The most popular standard cabinet sells for $1495. Cottage Craft Works does sell the Amish sewing cabinets a bit lower than what some other companies. But at these prices for particle board Amish sewing cabinets are a real bargain. True you do have freight cost and a wait time for one to be custom built. But even with freight fees the Amish cabinets are very much in the same ball park. 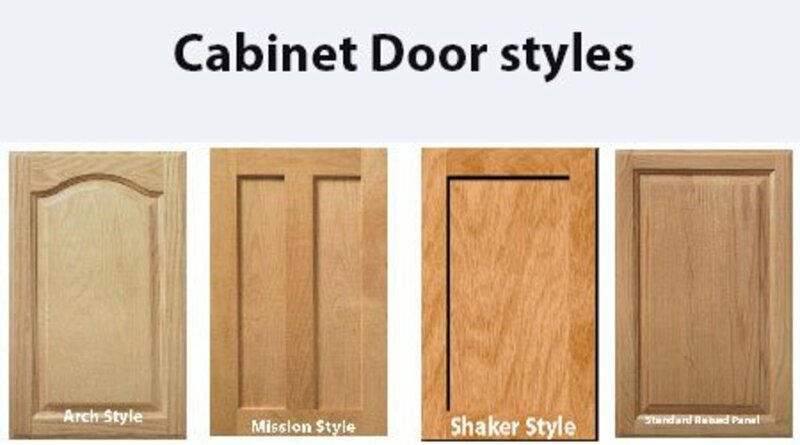 To put the two cabinets into perspective. For basically the same money you could go to a big box home center and purchase a cheap particle board kitchen base cabinet or go to a custom cabinet builder and have them build you a high end solid wood custom cabinet with dove tail drawers and high end full extension drawer glides. It just doesn't make a lick of sense on why anyone would spend so much money on a particle board sewing cabinet when they can have one made from solid hardwoods. 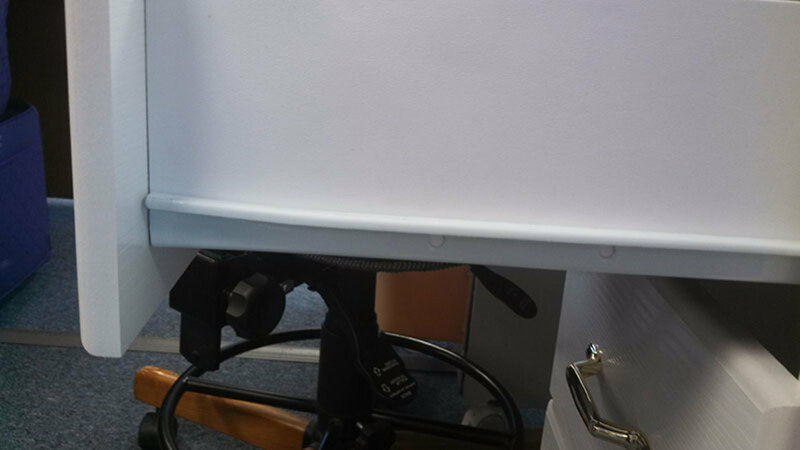 Several things have occurred in sewing room furniture over the past few years. Traditional manufacturing cost of the man made woods has increased dramatically. New competition selling Amish made sewing furniture has entered the market place. The Amish builders are small independent woodworkers with most of their shops cottage based right behind their homes. Most Amish builders are skilled hands on furniture builders who never skimp on quality, but with their lower overhead don’t have to include layers of corporate cost into the price of their furniture. The value of Amish hand crafted compared to laminate cabinets is very apparent once you begin looking. Amish crafted cabinets still use the old world furniture building techniques that have been passed down from generations. These techniques include raised panel hand crafted doors compared to molded pressed wood with a heated laminate cover. 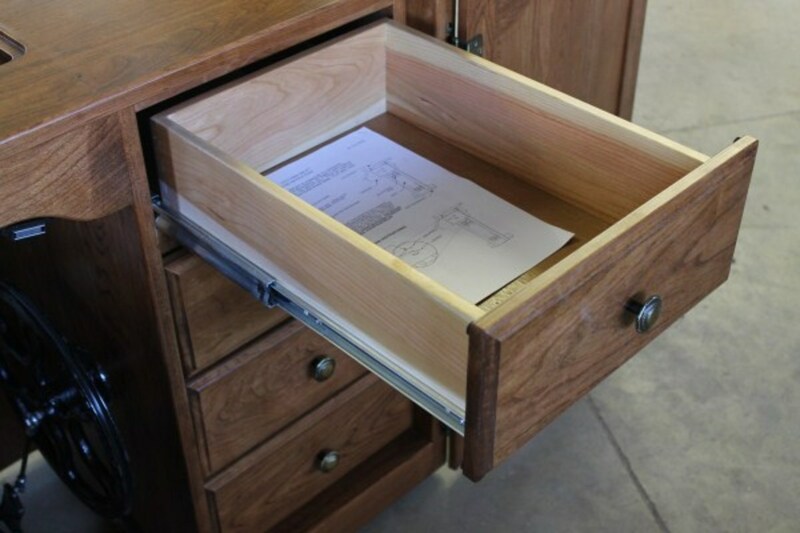 Drawers are still made with old fashioned precession dovetail construction instead of being just mitered, stapled and hot glued together. 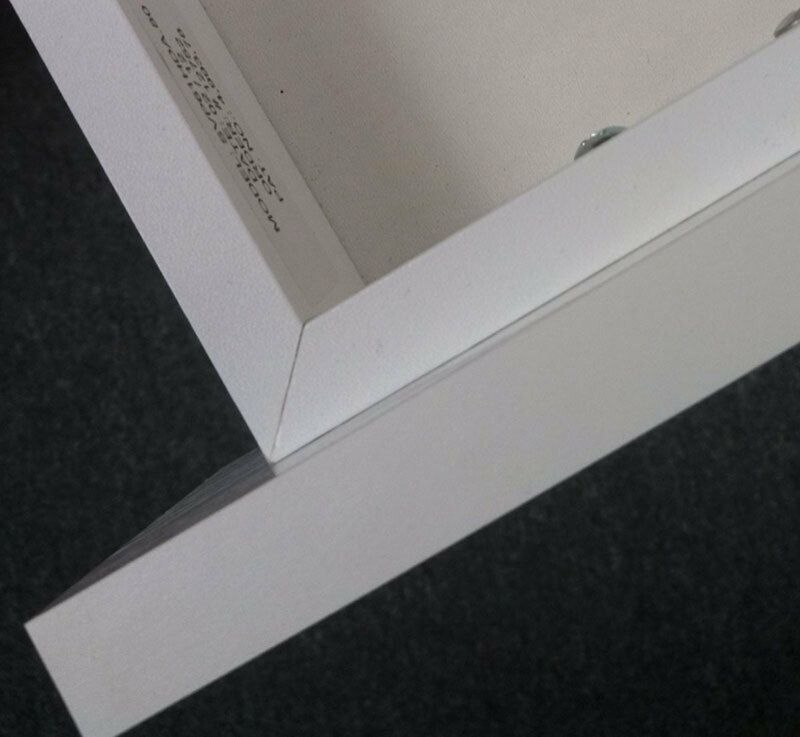 Drawer bottoms are made from laminated plywood instead of thin paper covered pressed board. 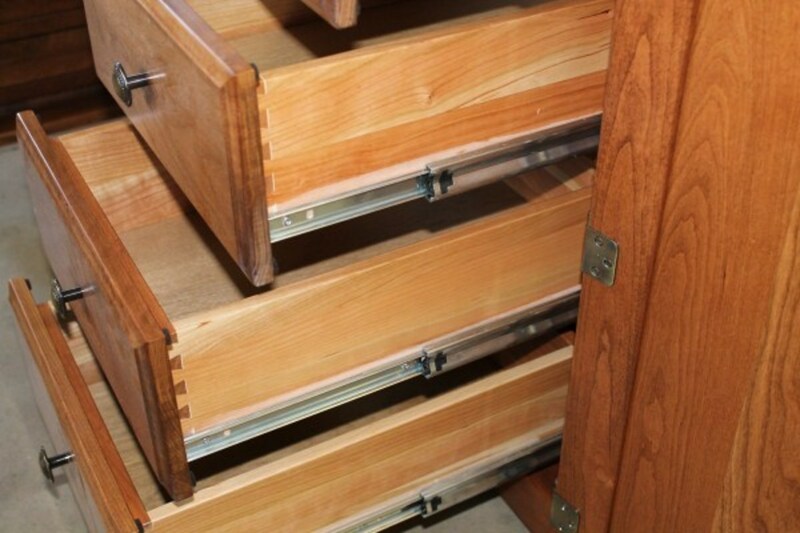 High end easy close drawer glides are used instead of cheaper plastic roller drawer glides. Instead of plastic accessory organizers the Amish still build roll out thread spool racks made of wood. The air lift is the only comparison between the cabinetry. 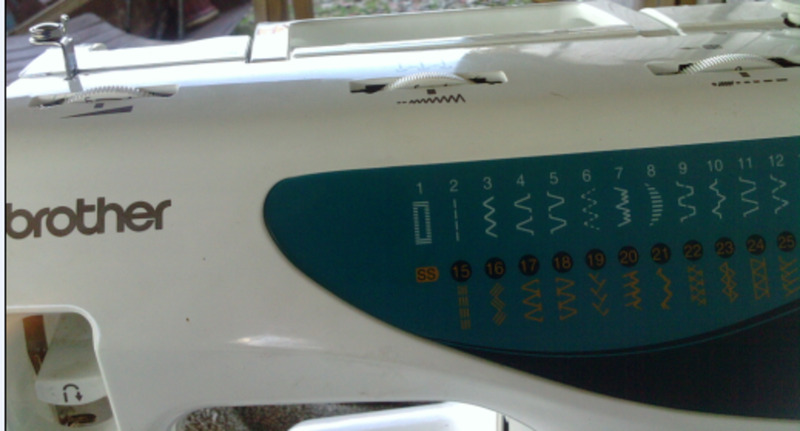 Both use the tap and adjust machine air lifts that can be set at flat bed height or embroidery machine height. What’s the difference in particle board and solid hardwoods? As many have discovered in buying a knock down book shelf or cabinet from a discount chain store, particle board just does not hold screws and other hardware devices very well. With very little movement side to side particle board chips out leaving areas that are hard to repair or replace. Particle board also absorbs moisture during high humidity periods and easily swells or bows underweight. Particle board furniture easily damages when moving. 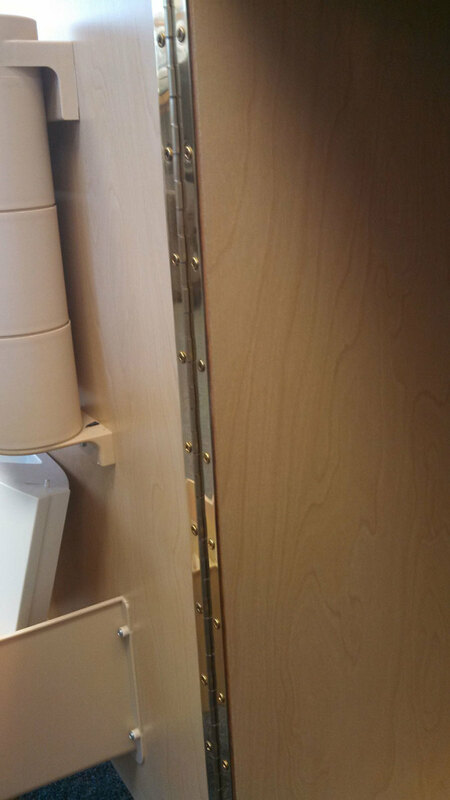 Hinges on doors and folding covers become loose over time by constant use. A book shelf sits fairly idle. On the other hand sewing machine cabinet doors and drawers are used constantly. In contrast solid wood holds screws and fasteners hold much tighter and do not chip or pull out as easily. Since the wood is solid on the tops and fronts normal wear can be sanded and touched up with new stain and finish. Once laminate chips out exposing the particle board there’s no repair. Why look for heirloom quality furniture? Heirloom furniture is becoming hard to find and most don't want to pay or can afford solid wood furniture. Today many enjoy antique furniture pieces. 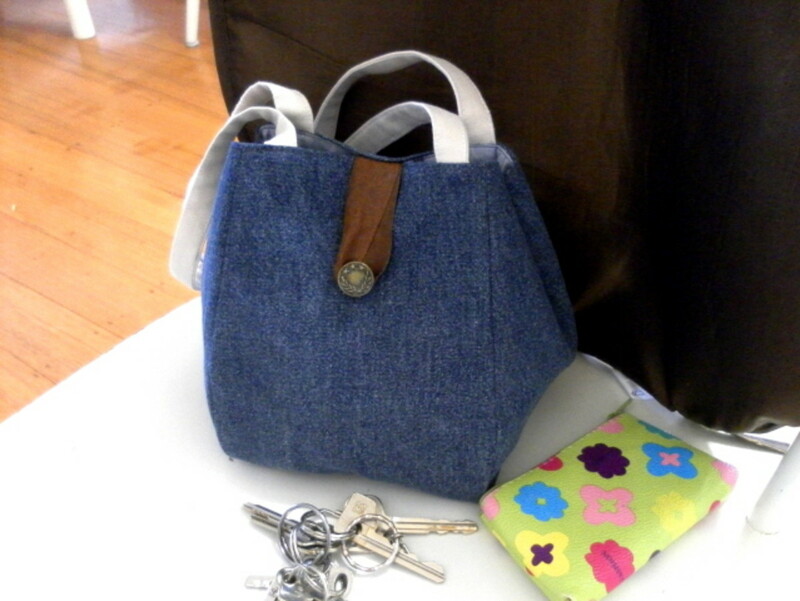 Some functional antique pieces are over 100 years old coming cross country in a covered wagon. Many pieces have become family heirlooms passed down from generations. 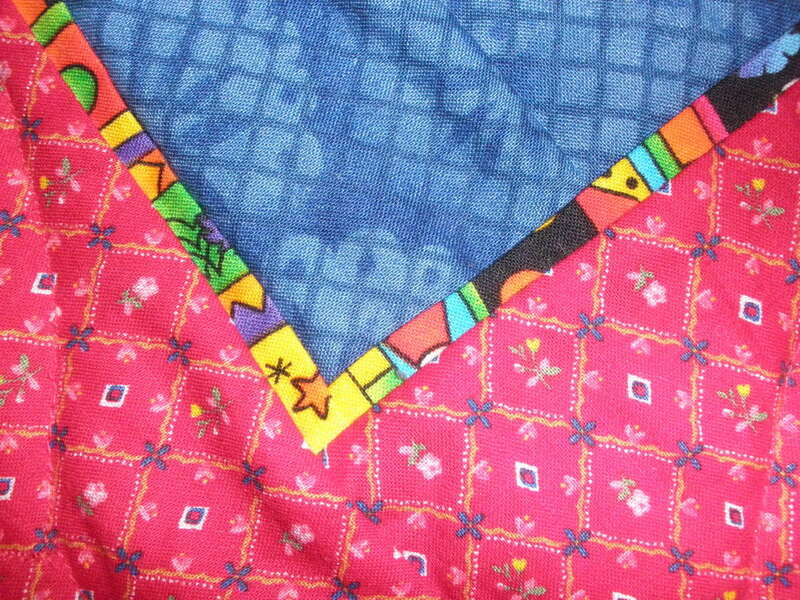 Many sewers today are still using the same sewing machine that their grandmother used to sew their first baby gown. Nowhere else is furniture still being built with old fashioned techniques like the Amish still use. While particle board furniture will become landfill pieces, solid wood Amish built furniture is likely more destined to become future family heirlooms. 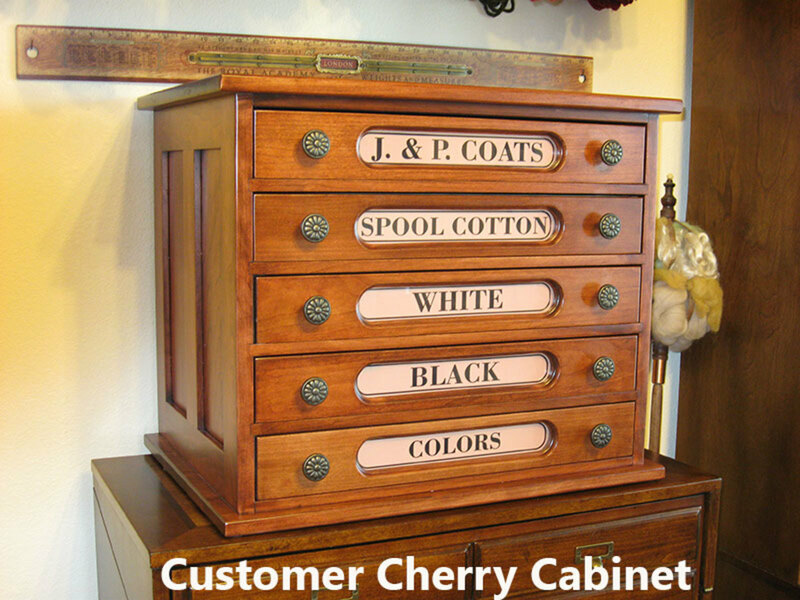 For additional sewing room furniture several of the Cottage Craft Works customers have also purchased the exclusive J & P Coats reproduction spool cabinet. 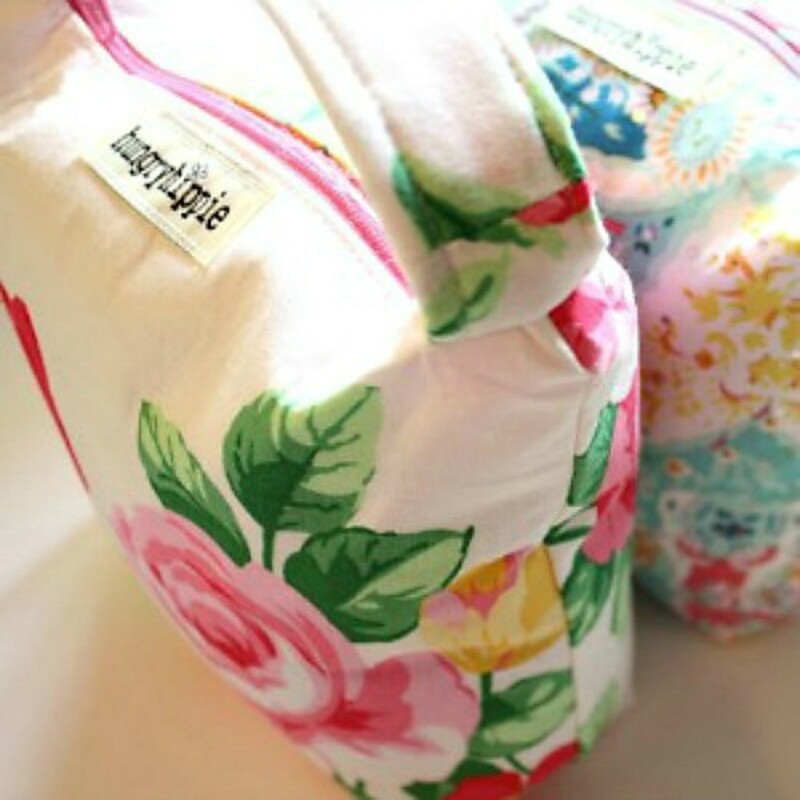 It is perfect for organizing patterns and sewing materials. The stunning beautiful cabinet fits right into the sewing room. 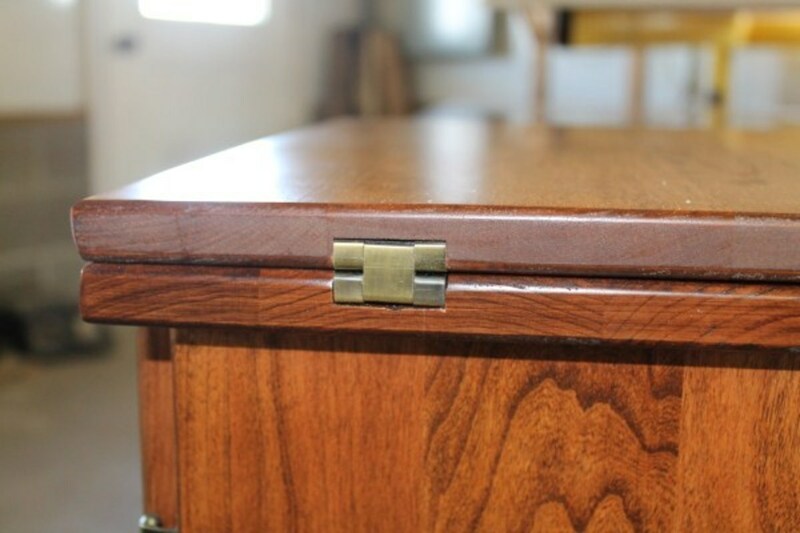 For those who still enjoy having a treadle machine or want to replace a broken down treadle cabinet to hold an old Singer Class 15 sewing machine, Cottage Craft Works customers have also purchased the reproduction treadle cabinets. 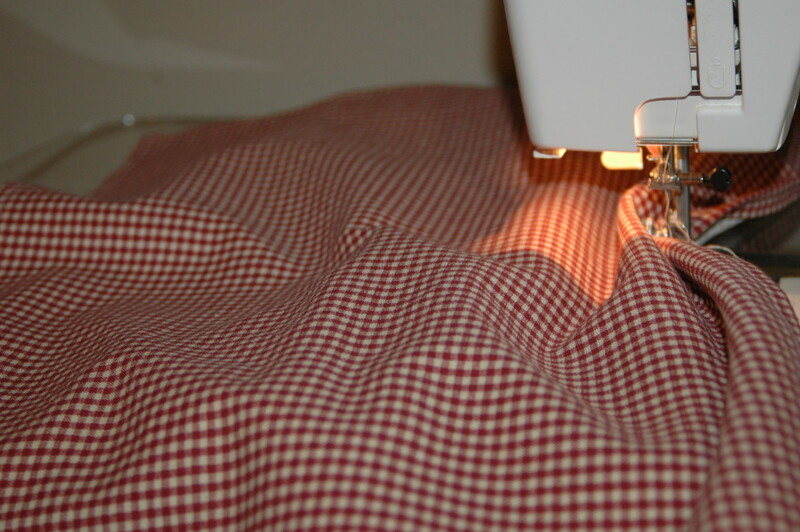 Do your own comparison by shopping the sewing machine centers and then clicking on the images and the sewing cabinet reviews from the various Amish stores. Amish cabinets when closed look like a fine piece of furniture. Cottage Craft Works allows customers to select from several door styles to fit an existing home decor. Dove tail of fashioned drawer construction. Note the high end drawer slides. Pull out drawer spool racks are standard on most sewing cabinets. The attention to detail and using recessed high end hardware is standard on Amish cabinets. 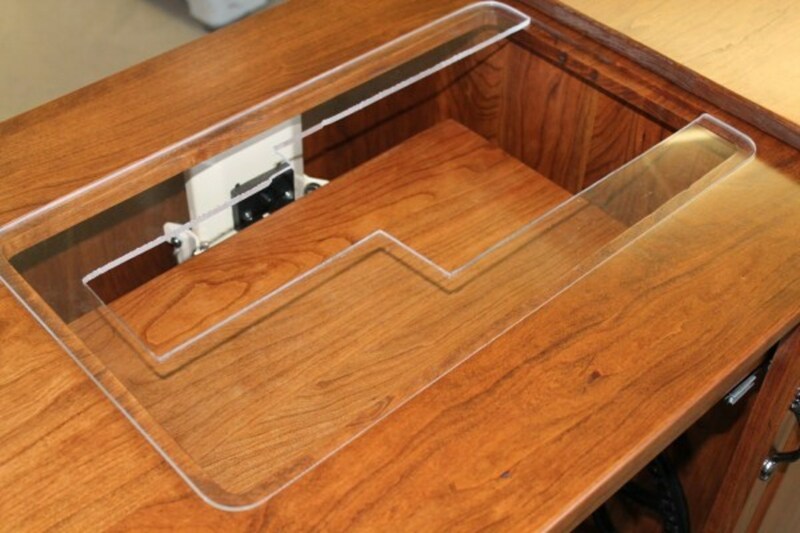 Plexiglas inserts are custom made to fit sewing machines. 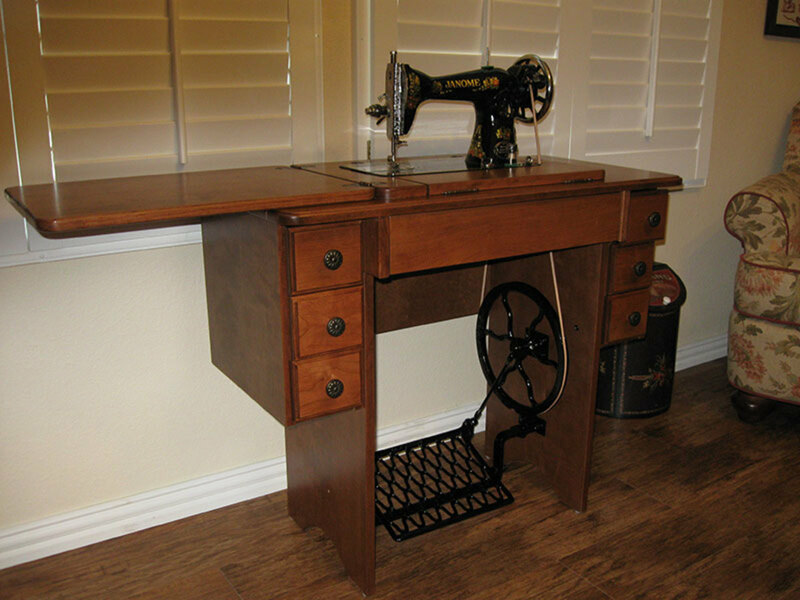 Sewing machines can be upgraded and used in the same cabinet. The J & P Coats reproduction spool cabinet from Cottage Craft Works has also become a popular sewing room cabinet. Many are keeping an original treadle machine in the sewing room along with an electric machine. This is a reproduction cabinet from Cottage Craft Works. Cheaper made particle board furniture drawer construction uses quick miter cuts, glue and staples. The particle board drawer didn't even make it off the show room floor before being pulled a part. 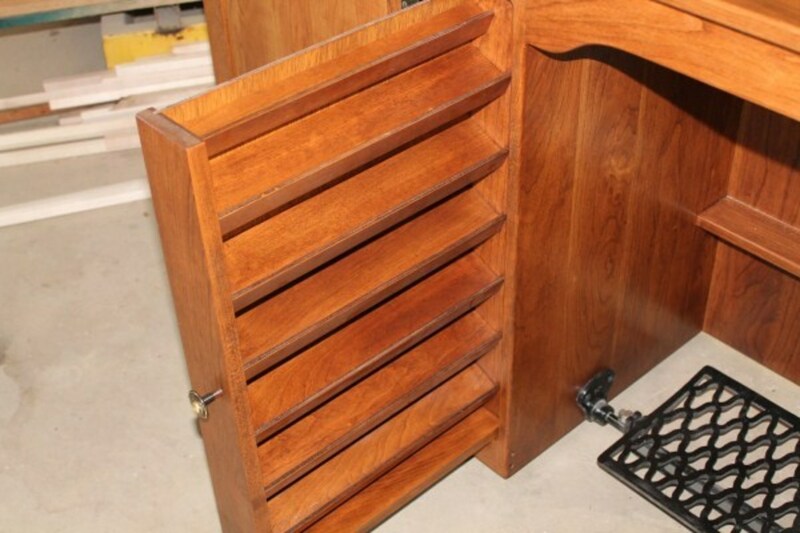 Particle board sewing cabinets use cheaper drawer glides and plastic rollers. 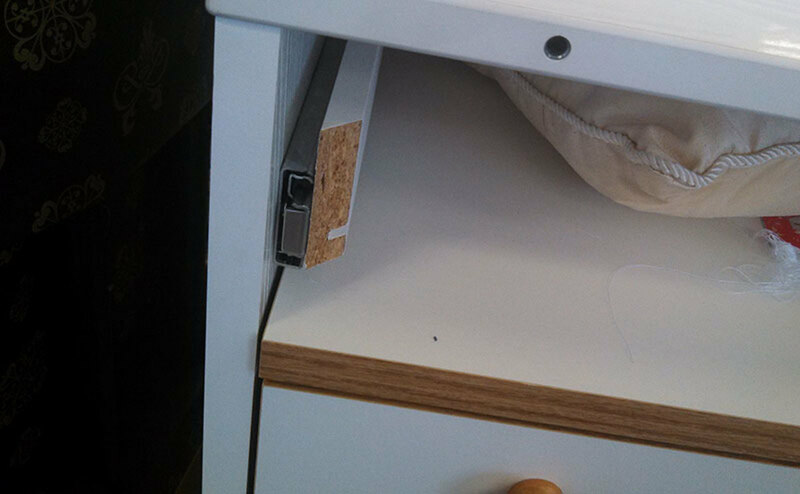 Particle board furniture can not take the mortising of hardware most is just screwed on top of the surface. Note the plastic trays. 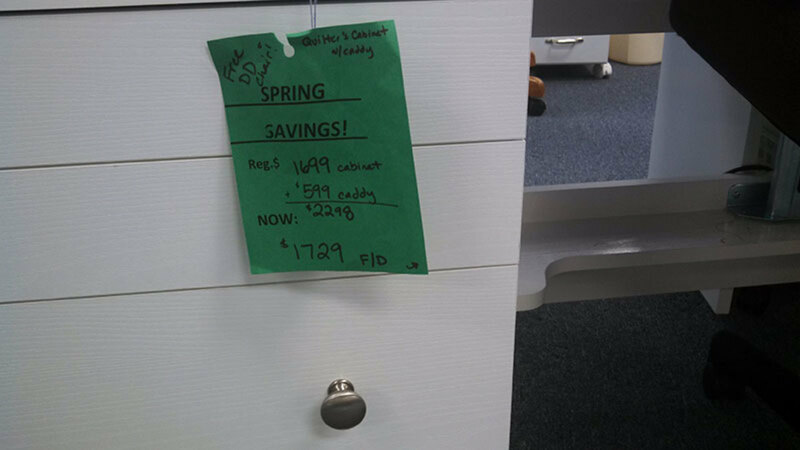 Not the mark down price tag for this white laminate sewing cabinet. 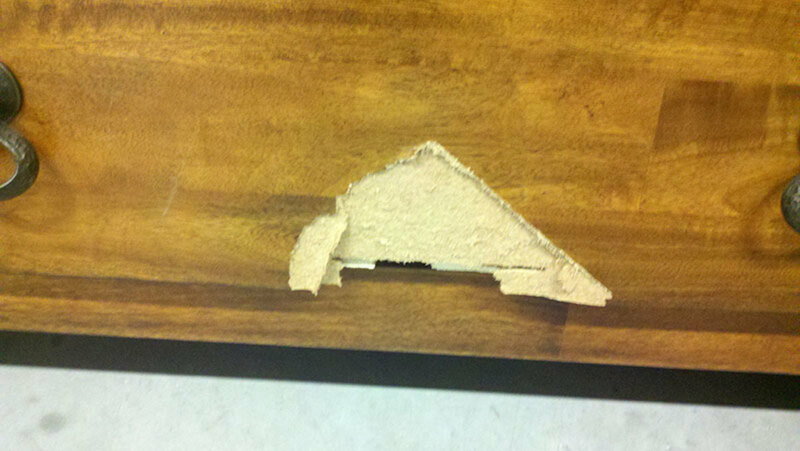 Particle board laminate covered furniture chips out very easily and is impossible to repair. 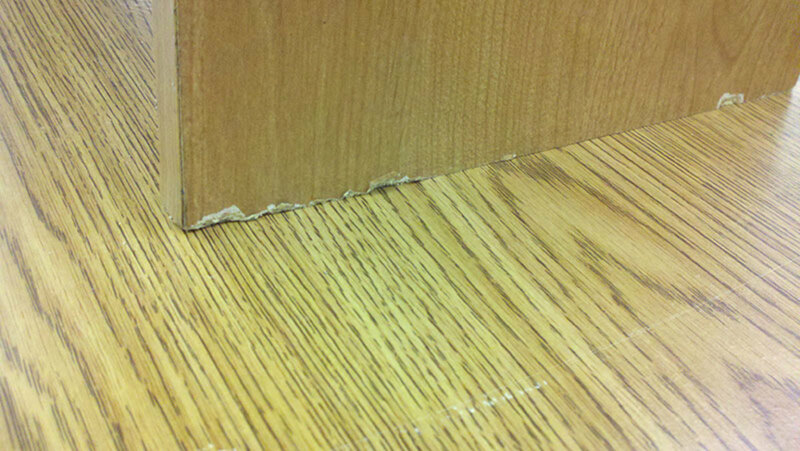 Bottom edges of particle board cabinet legs chip and wear when they are drug on carpeted areas. Table top insets made out of particle board also chip out leaving rough areas for fabric to snag on. I Love the look of these cabinets and would love one in my sewing room in my new home. Where are you located? Shipping is a major factor, as I am in Alaska. Alnoazaam-iafkrmation found, problem solved, thanks!